In the city of Porto Alegre (Brazil), the IV ISA Forum of Sociology will take place on July 14-18, 2020. This Forum has the goal to address the discussions and projects around the interconnections and possible solutions over four pressing issues: Democracy, Environment, Inequalities and Intersectionality. Take a look at the latest version of RC09 Newsl etter (autumn/winter edition), prepared by our Editor Ilona Wysmułek! Many thanks to our members who submitted their work for this issue, it wouldn’t be possible without your participation! We are happy to announce that we have launched our Twitter and Facebook accounts! 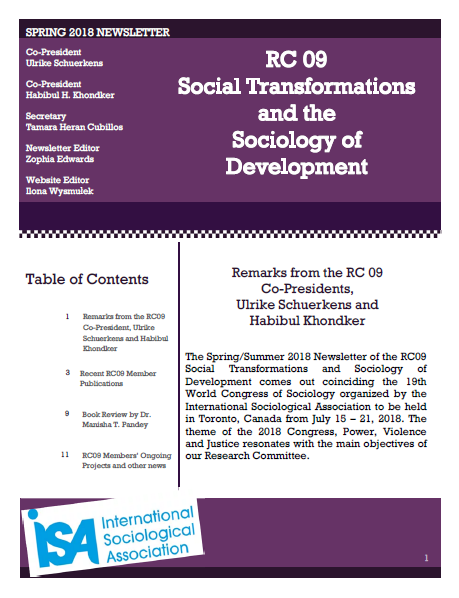 In order to maintain closer contact with members of RC09 and scholars interested in social transformations and sociology of development around the world, we are in the social media world! Our “presence” in social media will help us to reach more people and communicate better about upcoming events and other activities related to the committee and ISA, as well as to engage people in the reflection about pressing issues on the topics of RC09 interest. Click “Follow” and “Like” to keep you posted about activities, events and opportunities related to social transformations and sociology of development! The RC09 Executive Board 2018-2022 has been elected! We congratulate Habibul Khondker and Ulrike Schuerkens who continue to be the RC09 Co-Presidents! Rc09 also has a new Secretary/Treasurer Brian Dill and a larger team of website and newsletter editors – Ilona Wysmulek, Almendra Orbegoso, and Devparna N. Roy – honored and excited to serve the RC09 community of scholars! The newly elected board members are Samuel Cohn, Joshua Kjerulf Dubrow, Tamara Heran Cubillos, Hasan Mahmud, Dieter Neubert and Victor Roudometof. Looking forward to a fruitful and exciting 4-year period filled with new activities! Read more about the RC09 Executive Board, its members or join the network. We are pleased to publish our Spring/Summer 2018 Newsletter, prepared by the RC09 newsletter editor Zophia Edwards. We especially thank our members who contributed to this edition. We are pleased to share with you the online program for the XIX ISA World Congress of Sociology, which will be held in Toronto, Canada this summer – July 15-21, 2018! You can browse the Program by day, by groups and by person index or you may search for particular presentations by typing key words, an author’s name, or the title. Here is the direct link to the scheduling details of the RC09 sessions and oral presentations. Please note that the RC09 Business meeting will be held on Tuesday, 17 July 2018: 17:30-19:20. Location: 104D (MTCC NORTH BUILDING). As the Toronto 2018 ISA Congress is approaching, you may want to learn more about its participants. In our last Newsletter issue, we have added a new section – the information about the current research projects and grants of the RC09 members. You can also find references (and sometimes full texts) of the recently published and forthcoming RC09 member publications on this website or in our RC09 Newsletter issues. For the curious ones, we encourage you to see (or remind yourself) the results of a very interesting initiative – the RC09 members’ survey 2016 – prepared by Josh Dubrow. The main goal of this survey is to understand the research interests of RC09 members, their daily life of scholars and attitudes toward the role of ISA RC09 in their lives. The call for content for the next issue of our Newsletter will be announced soon. Stay tuned!